Pioneer Electronics has announced a total of eight new head units with the latest smartphone integration. The new models include five CD receivers and three digital media receivers. The company made the announcement via a press release yesterday. 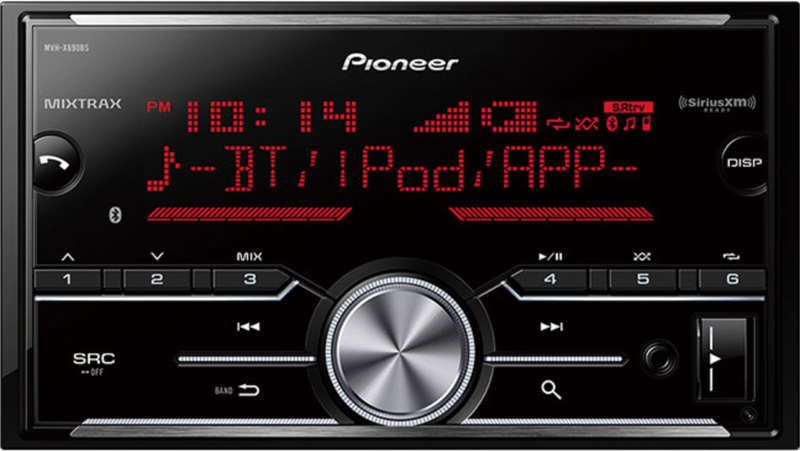 Pioneer Electronics (USA) Inc. introduced five CD receivers and three digital media receivers that offer advanced integration with many of today’s most popular smartphones1 and are designed to enhance the entertainment experience of practically any vehicle. The DEH-X6900BT, DEH-X4900BT, DEH-X3910BT, DEH-X3900BT and DEH-X2900UI CD receivers plus the MVH-X690BS, MVH-X390BT and MVH-290BT CD-free digital media receivers feature a variety of smartphone-centric technologies and entertainment options including advanced Bluetooth® functionality, Spotify®, Android® Open Accessory Protocol (AOA) 2.0 support, Siri® Eyes Free functionality, USB Quick Charge and USB Source Change Function. Pioneer also has two new subwoofers, the 12” TS-W306R and the 10” TS-W256R, both designed with advanced technology and innovative materials to provide accurate and impressive sound. · Bluetooth Wireless Connectivity – The DEH-X6900BT, DEH-X4900BT, DEH-X3910BT, DEH-X3900BT, MVH-X690BS, MVH-X390BT, and MVH-290BT feature built-in Bluetooth1wireless connectivity for hands-free calling and wireless music streaming. o Dual Device Connection – Full-time connection of two smartphone devices enables a call to be picked up by either of the paired phones, eliminating the need to pair and unpair devices, even while streaming audio from either device. o Auto Pairing – To simplify the Bluetooth pairing process with iPhone® devices, compatible models2 are enabled for Auto Pairing when utilizing a physical USB connection. Users simply connect an iPhone to the Pioneer receiver using an iPhone-to-USB cable, and the receiver automatically prompts the user to confirm pairing, eliminating the need to go through the wireless “searching for devices” process. o HFP 1.6 with Wideband Speech – Improves call sound quality for wireless conversations by increasing the frequency bandwidth dedicated to voice calling (now 50Hz - 7kHz) and doubling the sampling frequency (now 16kHz). The result is clearer and more distinct sound for both the user and the call recipient. o Music Library Browsing over Bluetooth (AVRCP 1.5) – iPhone owners can search through their playlists, artists, songs, and genres over Bluetooth. For Android smartphones enabled with Media Transfer Protocol (MTP), users can browse through folders containing media through folder type and browse in media content folders. The smartphone device must be compatible with AVRCP 1.4 profile or newer to access Music Library Browsing over Bluetooth. o New to the 2016 receiver line is the ability to register up to five Bluetooth devices into memory to enable automatic pairing. · USB Connectivity – When connected to an iPhone, iPod®, portable USB drives, or Android devices via the USB port, users can use basic controls (Play/Pause/FF/Rev/Random/Repeat) and display track, artist and album information. Android devices must run OS 4.0 (Ice Cream Sandwich) or newer to use Media Transfer Protocol. · Siri Eyes Free – Pioneer receiver models with Bluetooth enable users of iPhone 4s and above to access Siri Eyes Free3 with the simple press of a key. Siri Eyes Free allows users to make calls, select and play music, hear and compose text messages, get mapping information, listen to notifications, listen to calendar information and add reminders by voice. · Spotify (All models except MVH-290BT) – Control content from the Spotify app on iPhone and Android devices4 as a dedicated source on the receivers. Listeners can now play, pause and skip tracks using the Pioneer controls, and with a few taps, it is just as easy to browse playlists, albums and radio stations on the go. Premium5 users enjoy ad-free, high quality music and can download music and listen offline with no internet connection. · Advanced Remote Control (ARC) Application (all models except for the MVH-290BT) – Pioneer’s exclusive ARC app enhances the user experience of the new 2016 CD receivers for both iPhone and Android devices6. The ARC app utilizes the touchscreen of the user’s smartphone to display detailed artist and track information, including album art (not available on all sources), from various music apps and music sources on phone. Listeners can use the familiar smartphone gestures, swipe and tap, to control basic commands such as switching music sources, play/pause, skip, and shuffle/repeat. New for the 2016 models, the ARC app gives users the ability to adjust audio settings for the receiver directly from the app, including 5-band EQ (or 13-band EQ on higher models), EQ presets, subwoofer phase and level, bass boost, loudness, source level adjuster and fader/balance. · AOA 2.0 SUPPORT FOR ANDROID (all models) – AOA 2.0 enables Android device owners to play music streaming apps and control basic functionality, track up/down, play/pause and skip song using the buttons of the receiver. The new feature requires the Android device to be running Android 4.1 or newer and be plugged into the receiver via the USB connection on the front of the unit. · PANDORA STATION CREATION (DEH-X6900BT, DEH-X4900BT, DEH-X3910BT, DEH-X3900BT, DEH-X2900UI, MVH-X690BS and MVH-X390BT ) – The Pandora station creation7 feature enables users to create new Pandora stations while the app is in use with an iPhone device (physical connection required) or compatible Android smartphone. Users can simply press and hold a button on the new receivers to create a new Pandora station dynamically from the currently playing song or artist. · SIRIUSXM RADIO CONNECTIVITY – The MVH-X690BS is SiriusXM® compatible with the addition of a SXV300 SiriusXM Vehicle Connect Tuner (sold separately, SiriusXM subscription required). The MVH-X690BS is also compatible with the Tune Start™, Tune Scan™, Tune Mix and Sports Flash features of SiriusXM. · Both models offer customized audio adjustments for the driver including a 13-band graphic EQ and Time Alignment. · For enhanced sound quality and system flexibility, each model features three sets of RCA pre-outs that can be set in a traditional Front/Rear/Subwoofer configuration or switched into an advanced 3-Way Network mode with high, mid and low frequency outputs featuring independently adjustable crossover frequencies and output levels. · FLAC file playback capability via USB at up to 44kHz/16bit high resolution CD-quality audio playback and AAC file playback capability via CD8 and USB. Pioneer CD receivers will be available at the end of August with suggested retail prices of: $120 (MVH-X690BS) $110 (DEH-X6900BT), $100 (DEH-X4900BT), $90 (DEH-X3910BT), $90 (DEH-X3900BT), $90 (MVH-X390BT), $85 (DEH-X2900UI) and $80 (MVH-290BT). · Voice Coil Cooling System (VCCS) – Heat is removed from a new aluminum center dust cap for improved frequency response and higher power handling. · High Rigidity IMPP Composite Cone – The subwoofers are designed as a single piece composite cone to create a strong yet lightweight cone with more linearity. The dome shape of the IMPP cone provides increased strength and rigidity for optimized bass response. · Rubber Magnet Cover – The new rubber magnet cover absorbs excess vibration and offers protection for the magnet. · Extended Magnet Pole – The extended magnet pole increases the size of the magnetic field giving the subwoofers greater control and improved linearity. · High Power Overhung Voice Coil Design – The specially designed voice coil offers higher power handing, linear movement and greater excursion for extreme bass output. The new subwoofers will be available at the end of August with suggested retail prices of $100 (TS-W306R) and $90 (TS-W256R). Both subwoofers have limited distribution, for a list of where to buy, visit- http://www.pioneerelectronics.com/PUSA/Car/Subwoofers/Champion+Series. Pioneer Electronics (USA) Inc., headquartered in Long Beach, Calif., is a preeminent manufacturer of leading-edge technology solutions for the mobile electronics aftermarket. Its affiliate Pioneer Automotive Technologies (PAT) is a key supplier for Tier 1 automotive entertainment systems and components to vehicle manufactures. Pioneer is focused on creating the ultimate in-car entertainment experience with high performance audio and video components, as well as connectivity with today’s smart devices. Building off of more than 75 years of electronics experience, Pioneer has expanded into the cycle sports industry, designing world-class power meters and cycle computers for professional athletes and cycling enthusiasts. 1Bluetooth functionality requires a compatible Bluetooth-enabled mobile phone. Certain Bluetooth features may not be supported by all compatible Bluetooth-enabled devices, and/or the functionality of such features may be limited in certain devices or by certain wireless carriers. Dual Bluetooth Connection is available on all Bluetooth models except the MVH-290BT. 2Auto Pairing and Wideband Speech is available on all Bluetooth models except the MVH-290BT. 3Siri not available in all languages or all areas and features may vary by area. Cellular data charges may apply. Siri Eyes Free is available on all Bluetooth models except the MVH-290BT. 5Spotify Premium requires a monthly paid subscription. 7 Pandora app required. Feature requires compatible receiver and metadata must be available on desired track or artist from which user wants to create station. Apple, iPhone, Siri,and iPod are trademarks of Apple Inc., registered in the U.S. and other countries. SiriusXM and all related marks and logos are trademarks of Sirius XM Radio Inc. and its subsidiaries.